– Take a taxi or Uber. – Order a cup of coffee. – Make questions to foreigners in Santo Nino church and tourist spot. – Find tourist information and inquire. – Ask foreigners to take pictures. A total of 120-hour classes (1:1-80 hours, 4:1-40 hours) is provided for 4 weeks and a maximum of 40-hour optional classes is provided for free. This course is more focused on basic conversation skills and four macro skills by studying a step by step curriculum. Through daily assignments and self-driven study, learners will be able to accomplish their goals. Through a detailed leveling system, learners are given the most suitable curriculum and their study progress is monitored by managers for Academics. This course is designed to improve fluency by acquiring the four macro skills and the curriculum is proven its effectiveness for over 14 years. Moreover, this course is handled by the best teachers in Cebu. a maximum of 40-hour optional classes is provided for free. This course is designed to improve fluency by acquiring the four macro skills and the curriculum has proven its effectiveness for over 14 years. 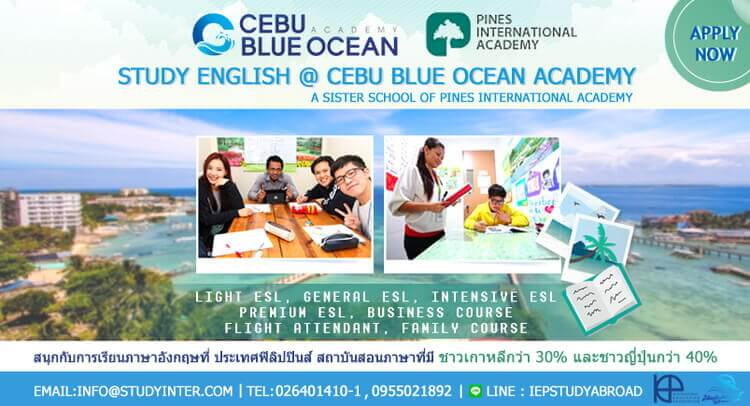 Moreover, this course is handled by the best teachers in Cebu. and a maximum of 40-hour optional classes is provided for free. Having 1:1 classes enables learners to study each learner’s lesson plans according to his progress. Blue Ocean TOEIC program is designed for TOEIC starters and those who need to get a high score. Studying TOEIC is fun. Learners will surely acquire advanced TOEIC vocabulary, grammar and reading comprehension skills by studying TOEIC. Blue Ocean Pre-IELTS program is designed for IELTS starters and those who need to get a target score band. Learners will surely be able to widen and deepen their English knowledge and language skills enabling them to adapt more easily in an English-speaking country. This course provides the basics of communication skills involved in business English. Be able to use practical patterns and related vocabulary in a wide range of situations. Demonstrating a presentation in English boosts learners’ confidence and develops their skills. for 4 weeks and a maximum of 40-hour optional classes is provided for free. are free to go out for their hobbies like playing golf, scuba diving, and other activities. Staying with parents makes a child feel more comfortable and this helps children improve English skills faster. Juniors’ program is open to other Asian countries. And it helps minors exchange their cultures and build ethics in language communication by mingling with classmates. Thanks to Social Network Service like Facebook, Kakaotalk, Line, Twitter, etc, children can keep communicating with each other after their graduation. Juniors’ program enables learners to be more open to new environments. And this might help them to visit other Asian countries where participants are from.